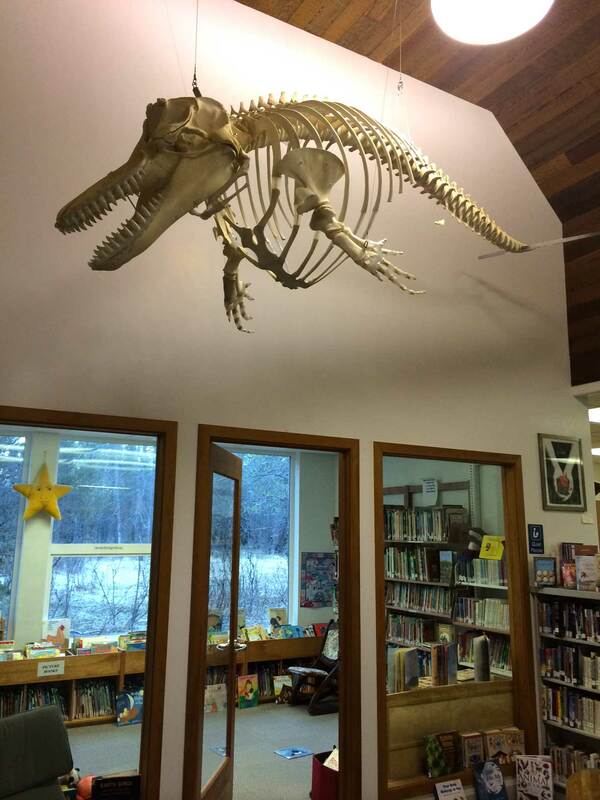 Last February, the wonderful Gustavus Public Library got a wonderful addition: the skeleton of a killer whale calf. The animal was found dead in Glacier Bay in 2005. Over the next several years the bones were cleaned (a smelly and long process), then rearticulated into a complete skeleton. Community members assisted in the re-articulation process, which was led by Lee Post, a specialist from Homer. On completion, the skeleton was welcomed to the library with song and dance—including presentations, music, and a ceremony by members of the Hoonah Indian Association, who gave the whale a special name: Keet’k’ (little killer whale). Now Keet’k’ swims above the entrance to the kids’ reading room. I love reading and researching in her shadow, glancing up every now and then to study her magnificent and graceful bones. You can read more about the project here and here.